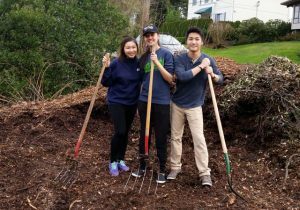 Matt Kwan, the Service VP for Alpha Phi Omega- Gamma Alpha (a UW service fraternity) brought his service group to the Meadowbrook Orchard recently. The organization has worked at MCGO for several years and been very helpful to keeping the Orchard tidy. This day they helped with the wet areas of the North Orchard and trail that goes down to the Meadowbrook Creek. 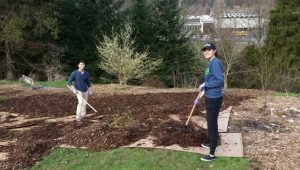 Mulching the area and removing the option to mow helps deal with the area as moisture collects at the base of the Orchard. Thank you Matt and gang!